One of the guest presenters at this year's West Virginia Book Festival was author Jaimy Gordon. Her books include "Bogeywoman," "She Drove Without Stopping" and "Shamp of the City-Solo." But it is her most recent novel, Lord of Misrule, that has gained the most acclaim, being the winner of the National Book Award for Fiction in 2010. It’s a novel set in West Virginia, amidst the world of horse-racing. 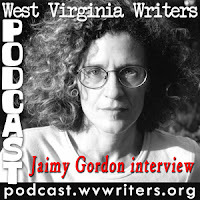 Jaimy was gracious enough to sit down with us for a conversation with fellow WV Writers member Dr. Edwina Pendarvis. Thanks go out to Phyllis Wilson Moore for arranging this interview.